Light salads, morning energy smoothies, collagen-boosting gummy bears — these are just a few of the countless creative ways you can get more bone broth into your diet. While sipping a hot and nourishing cup of bone broth is one of the easiest ways to get your daily dose of protein and energy-packed goodness, it might not be the first thing you want to reach for during the dog days of summer. You might also be short on time to make bone broth at home. But these are no reasons to miss out on all the health benefits of drinking bone broth. There are many healing properties of purchased or homemade bone broth. It can support gut health and aid digestive health issues such as leaky gut syndrome, thanks to collagen, gelatin, and a bounty of amino acids. Organic bone broth can also improve muscle recovery, relieve joint pain, promote healthy skin, boost the immune system, and can even support weight loss. It’s is an extremely versatile ingredient that can be used to infuse flavor and nutrient content in an unbelievable number of dishes, including cooked vegetables and grains, braised meats, condiments, and cool drinks. From a smoothie to a tasty side dish to the main event, there are plenty of ways to incorporate bone broth in your cooking. To get your creative juices flowing in the kitchen, here are 15 delicious ways to add it into your summer recipe repertoire. There are few better ways to start the morning than with a healthy, fast, and filling bone broth smoothie. We came up with four twists on our ultimate bone broth smoothie recipe, each of which can be made in under five minutes. Choose from four flavors: blueberry protein, green, mixed berry, or pineapple mango ginger. Not feeling smoothies? Try a shake. This hormone-balancing super drink combines bone broth as the base with fresh herbs and greens. It’s packed with protein and vitamins to boost the immune system and support gut health. Ice cubes are another way to sip on bone broth and cool you down in the heat. Flavored with herbs and spices, you can pop these protein-infused cubes into any beverage or add them to one of the aforementioned smoothies. Sip on a chilled summer soup with this gazpacho recipe. Few things evoke summer cooking more than a zesty gazpacho. Rich bone broth works to enhance the fresh flavors of peak-season tomatoes and peppers in this light yet filling soup. This creamy corn soup with charred jalapeno, avocado, and pepita salsa also uses a bone broth base to highlight the best summer of produce. It can be served cold for a refreshing lunch or hot on a cozy summer night in. For a snack or accompaniment to a main meal, this paleo ginger carrot puree made with chicken bone broth is so versatile it can be served hot or cold. Eat it on its own, add a protein for dinner, or top it with eggs for a fast, filling, and delicious breakfast. For fresh weekday meals, you could try cooking meats in bone broth. The beef in these Asian lettuce wraps is flavorful and tender after cooking it in bone broth, while crisp lettuce leaves and a lemony vinaigrette keep them light and perfect for a hot summer day. Another fresh idea: bone broth salads. Yes, bone broth salad is now a thing. And it might just become your new favorite, starting with this quinoa salad with bell peppers, cherry tomatoes, cucumbers, and red onion. Cooking the quinoa in bone broth instead of water infuses it with a meaty depth of flavor, and boosts the nutrition of the overall dish. Once you start cooking your salad grains this way, you may never go back. This seafood quinoa salad from StreetSmart Kitchen kicks up the flavor a notch with a zesty dressing made with old bay, Dijon mustard, and serrano peppers. Now that’s a creative surf and turf. Summer wouldn’t be complete without some classic cookout food. This keto friendly barbecue sauce could be the condiment to up your grilling game. Tangy, slightly sweet, and enhanced with nutrient-dense bone broth, it’s perfect for marinating meats and finishing chicken, or as a dipping sauce for grilled vegetables. Taco Tuesday can be made endlessly healthier (and tastier) with a little bone broth. These slow cooker crispy chicken carnitas by Kim’s Cravings do just that, as the chicken gets tender and flavorful from a long simmer in the slow cooker with bone broth. After being shredded, it then crisps up with a quick minute under the broiler. Soup recipes, of course, are the most obvious choice for using up that bone broth. And while it might not be the first thing you think of in the summer, few things beat a killer bowl of ramen any time of year. The ultimate comfort food, this easy shoyu ramen proves that with the right bone broth, ramen can be super easy to whip up when you need something delicious, nourishing, and fast. This 30-minute turkey meatball soup is a different take on a family favorite from Savory Lotus, who spruced it up to make it gluten-free, grain-free, and dairy-free with good quality bone broth. Risotto cooked in bone broth is a uniquely nutritious twist on a classic Italian dish. 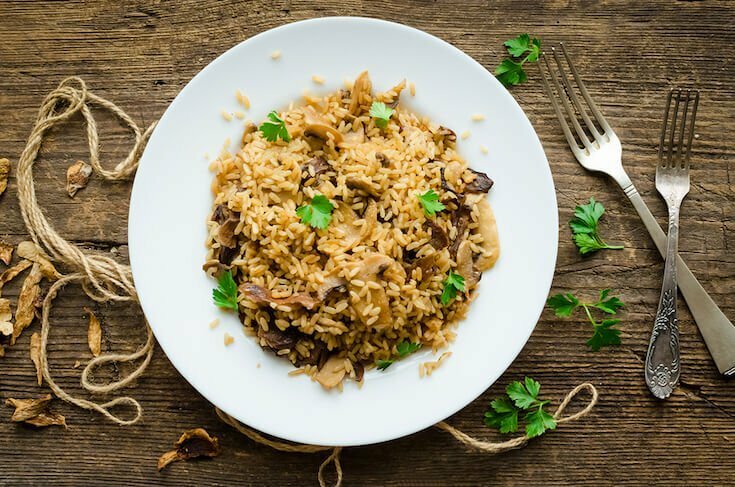 This recipe by Kalena Spire makes a creamy organic wild mushroom risotto that can be enjoyed any time of year. Let’s not forget about dessert. Relive a bit of your childhood while promoting youthful skin with these collagen-boosting gummies. Tart, sweet, and perfectly chewy, these raspberry gummies are a refreshing summer treat that will make you feel good inside and out. Whether you make your own or choose a ready-to-eat option, any summer meal can be instantly upgraded with the addition of slow-simmered bone broth. The foundation for many delicious real food recipes is broth — and you’ll be hard-pressed to find a foundation with more essential nutrients than bone broth.